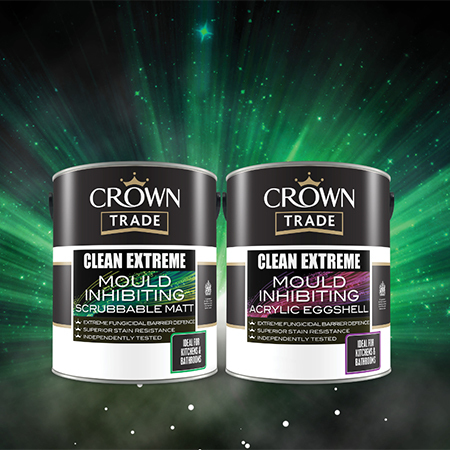 Crown Trade Paints have released their Clean Extreme Mould inhibiting paint range, offering long lasting protection from mould. The paint possesses built in fungicide that prevents mould growth on the paint film. It is available in a choice of matt and acrylic eggshell. The high opacity matt formulation provides durability even when scrubbed, with the Acrylic Eggshell option providing a high-performance stain resistant and washable mid sheen finish. The range also includes Clean Extreme Stain Resistant Scrubbable Matt and Acrylic Eggshell, and Crown Trade’s Clean Extreme Anti-Bacterial paints. Crown Paints is one of the UK's largest and most successful paint manufacturers with a rich history extending back over 200 years.